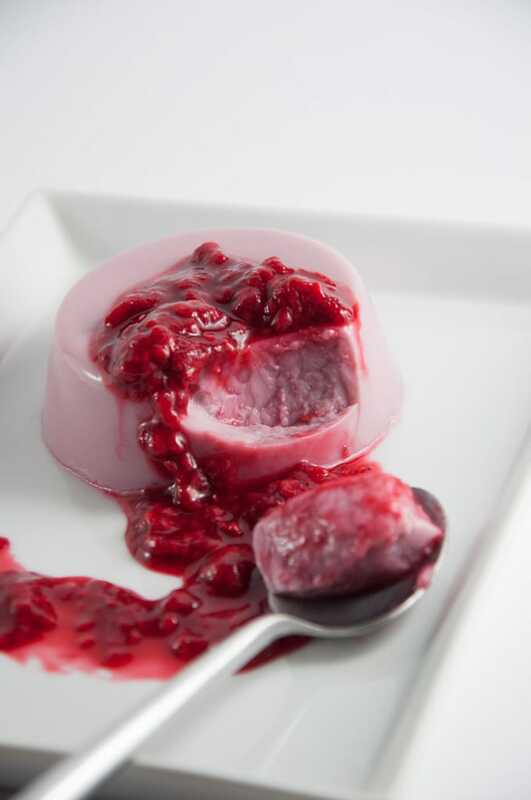 Recipe for a perfectly silky Raspberry Coconut Panna Cotta topped with a warm raspberry sauce. Perfect for Valentine’s Day. Vegan & gluten-free. 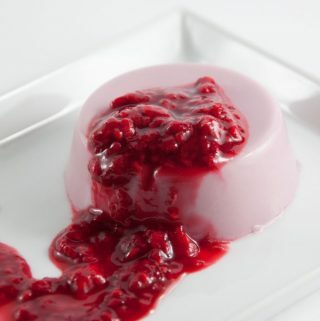 This super silky vegan Raspberry Coconut Panna Cotta is perfect for Valentine’s Day! You can prepare it the day ahead, that way you’ll have hardly any work on the big day. I’ve topped the dairy-free Panna Cotta with a warm raspberry sauce which is so simple to make but such an awesome addition, you really shouldn’t miss out on that one. All together, the dessert is not much work really. To remove the harder bits of the raspberries I’ve poured the panna cotta mixture through a nut milk bag. Panna cotta that just melts in your mouth…anyone? 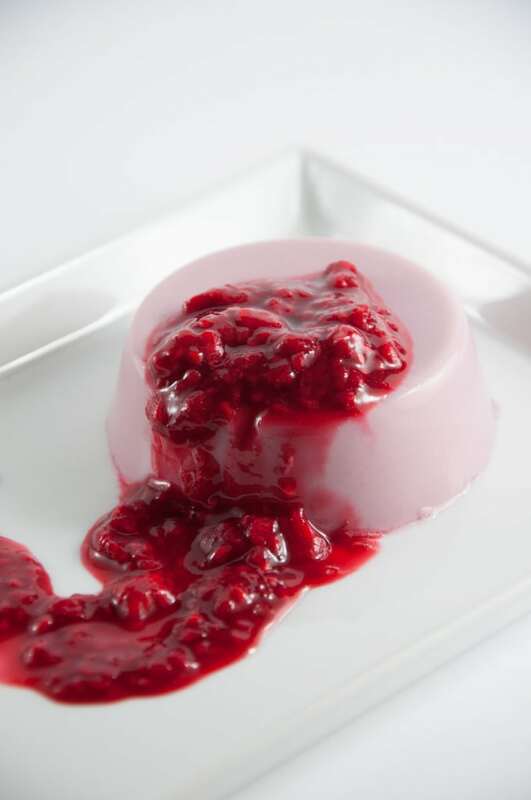 :) The Panna Cotta is not only dairy-free but also gluten-free and only needs 4 ingredients (including the raspberry sauce!). Perfectly silky vegan Raspberry Coconut Panna Cotta. Completely dairy-free! With a warm raspberry sauce on top. The perfect dessert for Valentine's Day! 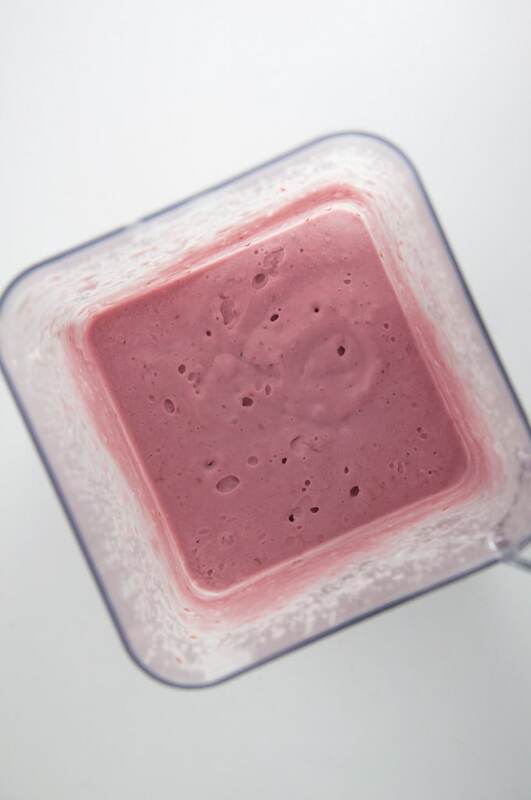 Add 1/2 cup of defrosted raspberries together with the coconut milk in a blender and blend until smooth. Place a nut milk bag over a pot and pour in the raspberry-coconut mixture, squeeze to remove the harder bits of the raspberries. Whisk in the agar powder and sugar and bring it to a boil. Let it simmer for 2-3 minutes, then fill the mixture into small glass or porcelain containers**. Let them sit in the fridge overnight. For the raspberry sauce simply simmer the defrosted raspberries together with the sugar in a small pot and mash the raspberries a bit. To serve, go around the edges of the panna cotta with a knife until you can take it out of the form. Top with the warm raspberry sauce. *I've used these glass cups. O goodness! You did it! Natalie and I have talked about trying vegan panna cotta forever…now we can! Seriously all that creamy fruity decadence in just 6 ingredients!?! Wow! This is some pretty serious competition for all the chocolate treats that are usually floating around for valentines day. Or just have both of course :) I really want to try this one! Can you replace Xylitol with caster sugar? Sure thing! It’s a great dessert for all year around. And I love that is really easy to make and can be prepared the day before. Thanks Jasmin! Seriously, I’m so going to make this now that my sugar-free month will be over tomorrow (had to include 1 Feb as I was still eating leftovers – like “your” lemon cheesecake with oreos on 1 January). Sounds divine and uses xylitol instead of white sugar which I haven’t tried but bought a small container of. Also, it’s soy free. Over the course of the christmas days, I’ve changed to xylitol for a granulated sugar completely (I’m still using brown rice syrup for a liquid sweetener), because my dad’s diabetic and I wanted him to enjoy all those delicious christmas cookies as well. I’m excited what you will think of xylitol! I hope you and Mr A will like the dessert :) I haven’t even noticed that it’s soy-free, good point! Today is our anniversary – one more reason to celebrate – and I hope mine will taste as good as yours look! Oh no.. too bad they turned out like that. Although could Coconut Panna Cotta Bowls be the next big thing?! :D Anything in bowls is so popular right now. So glad I found your blog today! This looks absolutely amazing dear! Pinning and making soon. This is great. I made it with strawberries and some modifications. I love your recipes. Thanks. Thank you so much for your comment, Nataša! I’m glad you liked it! Strawberry Chia Pudding sounds awesome! I adore pannacotta, and yours is so gorgeous! 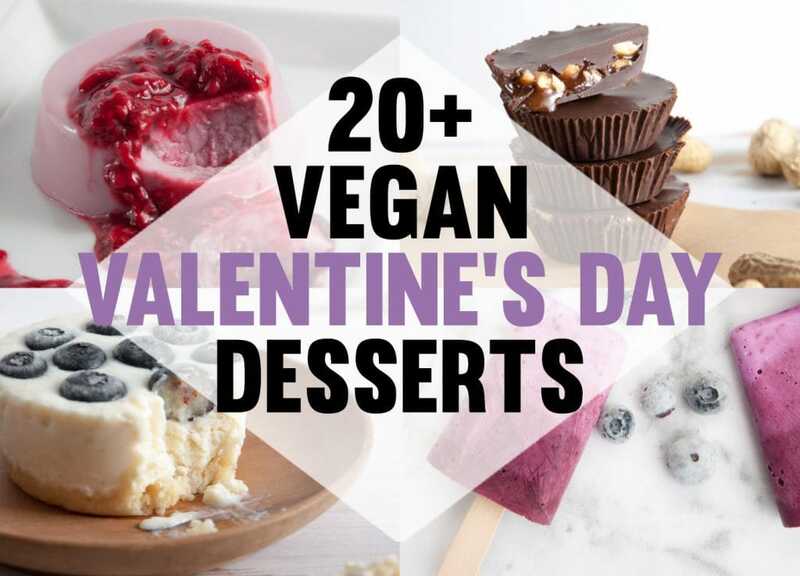 Thank you for letting me share it on my Vegan Valentine round-up – I really appreciate it! Thank you so much! This is such a great recipe. So fast and simple, and it turns out perfectly every time! So far I’ve made it with raspberries, blackberries, cherries and strawberries. Every time I bring it to a potluck, folks are elated that it’s vegan and gluten free, and people RAVE about how divine it is while I chuckle to myself about how fast and easy it was to make. Very grateful! You can! But agar powder is more powerful than agar flakes, so you’ll want to use 3 times the amount when using agar flakes. In this recipe = 2 1/4 teaspoons. Hi. Is it still the same way you make it wen heating the mixture if so that whould be great. I think I’ll be making it today with cherrys. Not sure, I understand the question fully.. but the basic process is: blend fruits with coconut milk, strain or pour through a nutmilk bag to remove harder parts, pour it into a pot, heat, whisk in the agar and sugar, bring it to a boil, then divide the mixture into the jars/glasses and let them sit in the fridge overnight to thicken. Hope it helps! Can I use xanthan gum instead of agar for this? Or is there any other substitute for agar powder? Really hard to find at my grocery stores!